Some exercise researchers think a simple change in weight training technique can have dramatic effects in building muscle. The super slow method of weightlifting is to lift the weights steadily under constant tension for 10 to 14 seconds, then release them slowly for five to 10 seconds. This varies from the usual method of lifting for five to seven seconds. The difference is that the muscles are exhausted (brought to momentary muscle failure) in fewer repetitions (reps), as few as five per set. 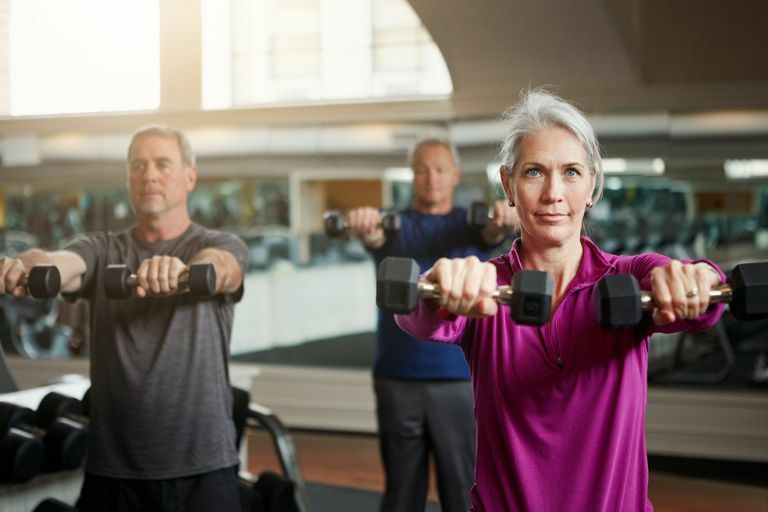 Super slow resistance training was touted by an older study that concluded it resulted in 50 percent more muscle strength in eight to 10 weeks for untrained middle-aged men and women. This was further supported in a later study of older adults. Another review found that the amount of load placed on the muscle with fewer reps at slow speed equaled or exceeded the usual training protocols with more reps at moderate speed, giving credence to believing you could get the same or better results lifting slower. As well, the risk of injury is far less than in using fast lifting methods. However, other authorities, such as the American College of Sports Medicine, remain unconvinced that there is evidence that this technique is any better than other weight lifting techniques. A session of weight lifting burns the equivalent number of calories many moderate-intensity aerobic exercises, such as brisk walking, but less than for high-intensity cardio exercises such as running. While it depends on your weight and the intensity of your training session, you can burn 112 to 250 calories in 30 minutes. But this is not the only thing to figure into the calorie equation. Working your muscles with the slow weight lifting technique brings them to the point of momentary muscle failure, which induces the body to build more muscle. Muscle burns calories even at rest, such as while you sleep. A pound of muscle burns an estimated three times more calories per day than a pound of fat. Because some proponents say the slow methods put on more muscle faster than regular weight lifting techniques, you might get a jump on weight loss or weight maintenance. Women and seniors, as well as men, could benefit. And don't worry, you won't bulk up, you will simply develop lean, fit-looking muscle to give your body a pleasing shape. Even if the slow technique doesn't put on muscle faster, it is still an effective way to build muscle. Muscle strengthening exercise is recommended twice per week for adults, especially older adults, to maintain muscle mass for health. It is easy to modify free weight or theraband resistance exercises to the slow method, just go slower. Another key is to go as fast as you need to keep the action moving rather than going in segments. It may take a couple of weeks to slow your motion while keeping it from being jerky. Start with low weights—even if you have been doing weightlifting exercises. See the difference that going slow produces. You will feel the burn and be amazed that at the fifth or eighth rep you just can't lift anymore. Stop then and go on to the next exercise in your routine. If you want to repeat each exercise for a second set, do so, although it is not thought to be necessary because in the first set you exercised your muscles to fatigue, which then induces them to build more muscle. To build muscle, do your weight lifting workouts every other day. You need days in between for your body to repair and build new muscle. Walking is a good warmup exercise to get your body moving. After your walk, spend 20 minutes on an upper body weight lifting routine three times a week. American College of Sports Medicine Position Stand: Progression Models in Resistance Training for Healthy Adults. Medicine & Science in Sports & Exercise. 2009;41(3):687–708. doi:10.1249/mss.0b013e3181915670. Fisher J, Steele J, McKinnon P, McKinnon S. Strength Gains as a Result of Brief, Infrequent Resistance Exercise in Older Adults. Journal of Sports Medicine. 2014;2014:731890. doi:10.1155/2014/731890. Westcott, WL et al. Effects of regular and slow speed resistance training on muscle strength. Journal of Sports Medicine and Physical Fitness. 41: 154-158, 2001. Wilk M, Golas A, Stastny P, Nawrocka M, Krzysztofik M, Zajac A. Does Tempo of Resistance Exercise Impact Training Volume? Journal of Human Kinetics. 2018;62:241-250. doi:10.2478/hukin-2018-0034.